Hard and Soft Easter Egg! 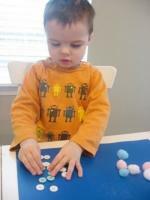 I was trying to think of ways to incorporate some of the work we've been doing exploring opposites with Easter crafts. 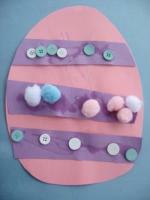 This craft can also be made more challenging by turning the stripes into a patterning lesson for older children. 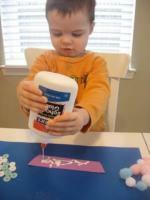 Toddlers like my son can keep it simple, learning about hard and soft materials while making a cute holiday craft. 1. Gather your materials. You will need 2 sheets of construction paper in different colors, buttons, pompoms, pencil crayons or chalk, glue, and scissors. 2. 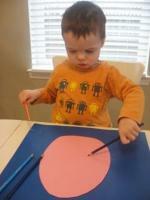 Cut one sheet of construction paper into a large oval. 3. Have children color the egg as they wish. Pencil crayons and chalk both make pretty light, muted marks that won't overshadow the rest of the egg. However, if you want to use markers go for it! 4. While they are coloring, cut some paper stripes using the other sheet. 5. When they are done, introduce the buttons and pompoms. Ask children to feel them, tell you how they feel and if they are the same or different. With older children, this is a great time for them to practice creating different patterns before making them permanent. 6. Hand them the stripes of paper and the glue. 7. Add the collage materials one type at a time. 8. Keep going until children are satisfied-I cut out 4 stripes but my son had enough of 3. 9. Let the stripes dry. 10. 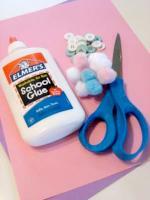 Glue the stripes on the egg and trim the ends if needed.